This week we caught several clear photos of Ford’s high performance Taurus prototypes and we caught them not far from Ford’s headquarters! Although it’s wrapped in camouflage, there is no mistaking as to what this is. Photos of a clay version leaked months ago, proving this is the real thing. Carrying over styling cues from Ford’s stylish European Mondeo, this all-new Taurus will hopefully add some much needed excitement to the Ford lineup. These particular prototypes are of the high spec model and it packs the 3.5L twin turbo V6. We hear it should be good for around 350hp (260kW). Only AWD versions will be available and we expect it to be fitted with Ford’s new SR1 (Shock Ratio 1) suspension system that is currently used in the Lincoln MKS. Expect some special chrome accents on the front end, twin pipes out back and 20 inch wheels on all four corners. 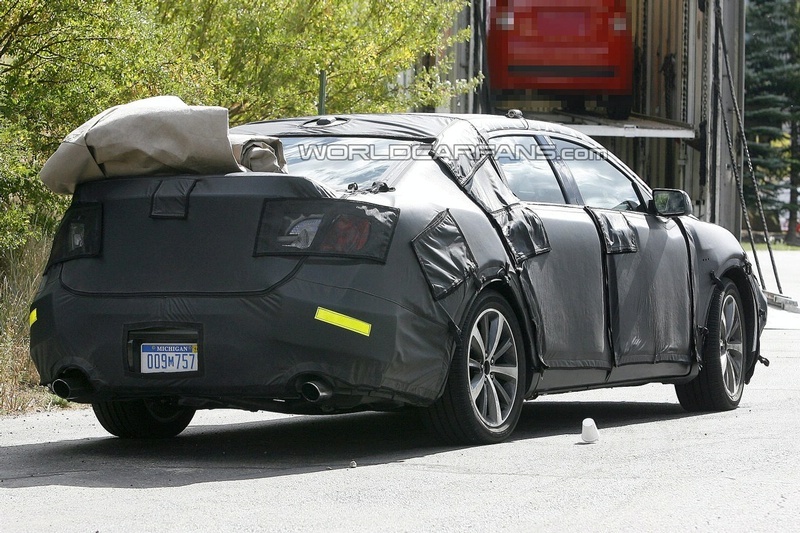 While some think this super-sedan will wear the “SHO” nameplate, a few unidentified but well-placed sources have informed us to expect a euro-inspired “ST” badge. We will know for sure in early 2009. The Taurus powertrain is nominally front-wheel drive but fortunately, the Taurus has optional all-wheel drive. It’s standard in the SHO, and it torque steer that would have a front-drive Taurus SHO pointing any which way but straight ahead when the power was poured on.